Did I get your attention???? If you've ever called another mom crazy or an anti-vaxxer I urge you to continue reading and try to see life from our eyes. If you are a crazy anti-vaxx mom then I hope reading my story helps you realize that you are not alone! You are part of my tribe!! At the end of the day aren't we all just trying to do what is best for our children?? How many times have you been called an "anti-vaxxer"? Told that you don't have a medical degree so you can't possibly know anything about vaccines, been called awful names, stupid, ignorant, or worse, told that your child wasn't injured by vaccines, they are perfectly safe, you are just a CRAZYMOTHER! How about being called Dr. Google?? I was once told I was garbage and ridiculous then blocked on FB by a girl I've known my entire life when I said I stopped vaccinating. I had a grown man on FB recently use very vulgar words towards me on a post I made about vaccines. See below. When did it become ok to talk to a woman like this??? Did you catch that I said "stopped" vaccinating?? I used to be a pro-vaxx mom, I thought moms who didn't vaccinate their children were crazy and reckless. I thought that if they didn't vaccinate their children then their children would absolutely die from some awful disease. I "thought" what I had been programmed to think. I never thought to question any of it. My 2 older children were fully vaccinated, I remember having anxiety taking them to doctors appointments and holding them down as they screamed during their shots but it never went further then that. I never knew that things like chronic ear infections, chronic strep, autoimmunes, ADHD were adverse reactions of vaccines. I thought they were just part of childhood. Vaccines are not treated like other medications. They are labeled as “one size fits all”. Depending on your genetic make up you may not have a reaction, you may have a small one, or your baby may pass away from a severe reaction. Luckily Anya's reaction was very mild compared to so many others! More on that later.....keep reading. So what prompted me to stop vaccinating?? You know I really wish more "pro-vaxx" people would stop and ask this question instead of getting nasty with us! They are so afraid of something they don't understand but I get it. I was that way for a long time too. They think we just woke up one day and thought "It's so nice outside, I think I'll stop vaccinating little Billy" lol They don't realize the HOURS we spend daily researching and talking about vaccines. Ever wonder why we spend our time talking about this hot topic?? I can tell you it's not because we enjoy being harassed and belittled. We don't want any other mothers to have to go through what we did. We feel a duty to share what we learned like someone did for us. I just found this on my instagram. I was that provaxx mom, until I wasn’t. I will never stop informing other mamas of vaccine dangers. Everything about this picture is so wrong but I had no clue at the time. I called the doctors after hours line and they told me her reaction was completely normal. The story behind the pic....Anya screamed for HOURS after her 2 month vaccines, I couldn’t touch her or hold her. I gave her Tylenol per the pediatrician, you don’t know what you don’t know and leaned over her on our bed nursing her without touching her body (she screamed bloody murder when I tried to touch her). The injection site was red and swollen. She finally was so exhausted she fell asleep and slept for hours. A few days later she developed eczema. We are SO lucky it wasn’t any worse. I was told by her doctor that this was a normal reaction but it didn’t sit right with me so I started looking into vaccines, I had no clue where to start. I was hesitant about getting her 4mo shots but her doctor convinced to do them. I felt sick leaving the appointment. I knew in my heart this wasn't right. A friend connected me to one of those anti vaxx moms she knew who was happy to answer my questions and point me in the right direction. I was also blessed to have a girlfriend with a vaccine injured child and an aunt who also helped guide me. Not everyone has the support I did and many are afraid to talk to their friends and family about their decisions on vaccinating. Anya will be 2 next month and hasn’t had a single vaccine since 4 months. She’s incredibly healthy and has never been on an antibiotic. We also no longer keep Tylenol in our house, learn more about the dangers of Tylenol HERE or HERE. If you continue vaccinating please stop giving your children Tyelnol before or after. Learn more on this HERE. If you are on the fence about vaccines PLEASE keep digging! You can always go back and vaccinate but you can't UNdo them. All this aside I am ALL for a parents right to choose and I support parents on either side of this debate! I never get nasty or knock another parent for their decisions. I'm urging everyone reading this to take a step back and listen before judging! We need to support each other and mom shaming NEEDS to stop!! 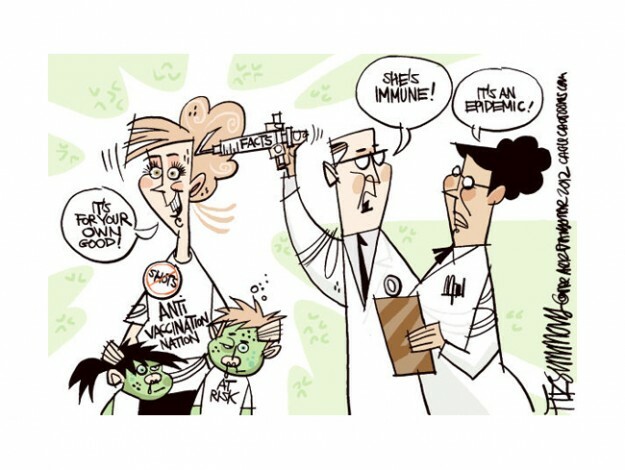 Sadly this is often the way vaccine conversations go. I recently found my 11 year old’s medical records and was shocked at what I learned!